No, it’s not. 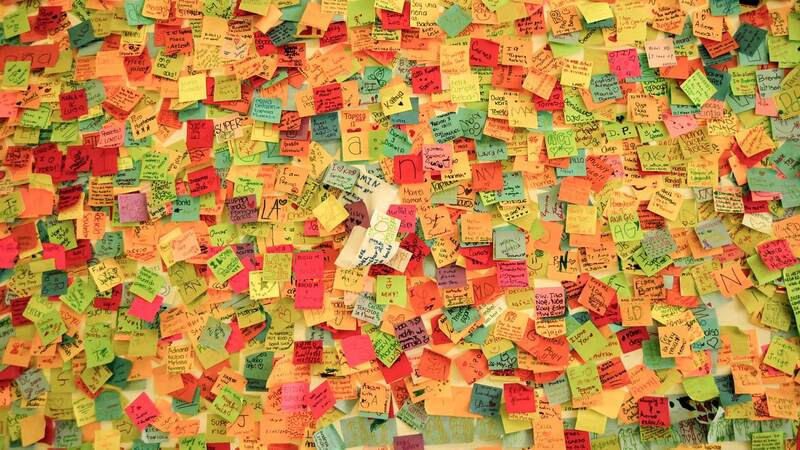 I’ve seen many activities of this sort: filling in colorful post-its and using them to cover up walls. In the end, it always looks pretty cool; everyone is thrilled. But actual results just won’t live up to the expectations. After all, Design Thinking is just a tool, only as useful as its user’s skills. And let’s be realistic: so many people are today using this tool; some of them are just bound to not know how to make the fullest use of it. In order to embark on a Design Thinking journey, there are a few musts: the creative concept must be fully understood, there must be enough time to really immerse in the proposed problem, adequate space for analyzing insights, and, most of all, ability to coordinate people with completely different points of view – which is exactly responsible for sprouting rich and (we hope) provocative ideas. This is where innovation begins. And when it does, the most important part of the process is then afoot: experimentation. Danger lies in the fact that many clients think that receiving a list of neat opportunities is the main delivery of the entire operation. But this is when things only start to sizzle: it’s finally time to put these ideas into practice, to test them and make sure what works and what doesn’t, making possible corrections and getting rid of what doesn’t add any value at all, registering everything we learn that will make a difference in the future. The most innovative companies in the world are precisely the ones that have most experimented with a myriad of alternatives. This results in an extensive repertoire that allows them to identify earlier and earlier the potential value of given initiatives. It’s naïve to believe that companies with genius solutions got it right on the first try. Usually, products and services that thrive – and most of them have left the competition behind – are the outcome of a journey that has shaped an innovation culture little by little, bringing in talented people, restless executives, and shareholders open to weighted risks. A simple example is Whirlpool, one of its industry’s most ground-breaking enterprises. The company took an important step nearly 20 years ago, when they decided their recruitment procedures would prioritise candidates willing to make changes and take risks in favour of alternatives never trialled before. Nevertheless, the rise in popularity of Design Thinking has undeniably granted us designers our own share of benefit: it has explained to many people how our mind works – we, who have always been outsiders to the creative world. What’s more, those who were still oblivious of what we exactly do started to consider the idea of getting more familiar with the work of those behind the methodology. And they realized how silently – but quickly – did Design evolve in accordance to people’s radical shift of behaviour, seen in the development of technologies available every week (digital or not) and the research techniques that let us into the heart and mind of users. Beyond products and services, today we are able to conceive creative and high-value business models, aligned to expectations of consumers in a new era, with demands and requirements that are challenging for all. Through what we call Systemic Design, we conduct different procedures: research, strategy, products, services and digital development, which used to act separately and now work cooperatively and in sync, under a single orientation and schedule. Great business consultancies have seen this. Deloitt has its own design branch within Doblin. McKinsey did the same with Lunar and so did Accenture with Fjord, just to mention a few. Their aim is one only: to make their clients more competitive through clear benefits of high perceived value to their final customers, which is exactly Design’s speciality. In Brazil, Questtonó Design and Innovation Consultancy is the maximum expression of this multidisciplinary approach – and it just keeps growing. This is why I chose this company to be my new home. After many years as a design and innovation executive for one only company, I sought a new path to amplify my belief in Design as a strategic tool for enterprises who want to better themselves, through products and services projected for consumers more and more engaged with causes my colleagues and I stand by. Systemic Design as we apply it at Questtonó is a guarantee that, far beyond post-its on the wall, we are committed to deliver quality in form of research, conceptualization, solution development, strategy and branding, satisfying our clients and also their own customers.